Blocked drains or blocked traps can be a real pain, particularly as they often cause an unpleasant odour as waste water is unable to escape. Clearly this is something we could help you with, but if you are prepared to try a few things yourself (or have a neighbour who might be willing to help), you might be able to solve the problem yourself. Here are a few tips for both blocked drains and blocked traps. If you would like a bit of advice over the phone while you are trying to sort the problem, by all means call us on . Good luck! Drains are normally outside a property and are often tucked away in places that are not regularly seen or inspected. Hence, problems can build up un-noticed. Furthermore, as they are outside, all sorts of things like leaves and general debris can get into drains and block them. 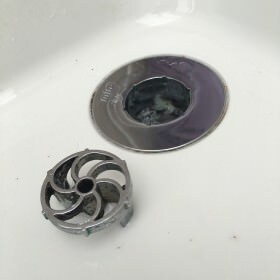 Normally, the first sign that a drain is blocked is when it has got so blocked that waste water starts backing up and flowing out of and around the drain itself. Time for action! Drains are normally linked to a manhole and the first thing to do is to find the relevant manhole and try to work out where the blockage is. For example, if the overflowing drain is a drain with a metal grille with waste water seeping out and the manhole that it is linked to is clear (this can be tested by directing a hose into the manhole and seeing if the water drains away properly), then the blockage is between the drain and the manhole. If the manhole is full or part full of waste water, then the blockage is either in the manhole or downstream, so to speak. You need a very large bin or container (wheelie bins are perfect for this), which you need to fill or part fill it (depending on size of container) with water and pour the entire volume of water either down the drain or into the open inspection chamber. Do wear suitable footwear and clothing, get ready to jump backwards and please be aware at all times that you are dealing with hazardous waste, so do take precautions. Very often the sheer weight of water will be enough to push the blockage through. If the chamber or drain is completely full, so pouring water down is not an option, you could try using a plastic pipe (ideally plumber’s rods) to try and release the blockage if you can reach it. Be careful not to use things like wooden sticks that are likely to break and add to the problems. Sometimes a poke in hole with a sharp stick is a good idea! Fingers crossed! If you have a sink, bath, basin or shower that is slow to empty, this is usually a sign of a blockage forming. With a sink, bath or basin, you can often remove the trap yourself to check for obstructions. There will be a little bit of water in the bottom of the trap, so you may want to put a bowl under it when removing. If the trap is clear, then the issue is further along the line. Some household products such as Mr Muscle do help, providing the blockage isn’t too severe. There are much stronger products available, but these are to be used with extreme caution. If the problem is with a shower tray, then unfortunately the removal of the trap is often far more difficult, so it’s probably best getting professional help. You can usually, however, remove the centre section of the trap which has a removable part for cleaning out old hair etc. which often does the trick.